Jeez, this concussion business isn't fun. Ok, so it's only mild concussion but still. The 'cotton-wool-head' I can deal with as my meds do that. Some would say that space cadet mode is rather normal for me. But the restlessness and agitation? And the confusion and weird sleep patterns? No thanks. Thankfully it's subsiding now, but I sill have the bumps above my eyebrow and on the bridge of my nose - is it normal for bumps to last this long? And then there's the constant headache. Tsk. The door I hit is of the heavy duty glass, sliding variety. So no surprise it bloody hurt. And having never had a black eye, I was secretly hoping this would be my my moment but the bruises faded quickly. Oh well. So. Big Brother. Well, he's the new jumbo flyer! Yey! Now, you wouldn't think getting a mega flyer for spinning thick novelty yarns and getting extra yardage from a skein would be difficult. By enquiring, I managed to cause some confusion and disagreement between two very knowledgable and experienced wheel knowers. A tad embarrassing, to say the least. But I have learnt a heck of a lot about Ashford spare parts! Turns out that my flyer unit is actually from a Joy. And there isn't a jumbo flyer available for a Joy. To cut a very long story short, Martin of P&M WoolCraft has been my hero. He told me we could fashion one from the body of a Kiwi jumbo, with the shaft of a Joy flyer. A little bit of fiddling and adjusting from Tom, and now my Hitch-Hiker has a new attachment. Thank you Martin, I'm extremely grateful. If you ever need help with your Ashford, he's the man to talk to. And now we're ready for some seriously funky yarns. The wonderful Maylin sent over a welcome present for the new wheel - check these fibres! Mohair clipped from her own goats, and dyed by her own fair hands. These are so incredibly soft, and weighing in at 250g in total, I am so incredibly thankful! Aren't they beautiful? Maylin, you're a star. Despite the jumbo not being ready at the time, I had to have a play with these fibres. 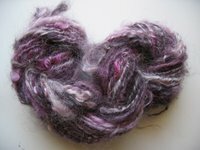 I set about core spinning, using a black single, about 4ply gauge to wrap the mohair onto. It did keep getting stuck on the hooks of my normal flyer, yet I'm really liking the result. Now that I've got the right tool for the job, there'll be much more experimentation along these lines. Quick to spin and amazingly fluffy, this stuff is cool. Love it. This is the yarn I was spinning wednesday evening at my Dad's barbecue. I was trying for a deliberate thick n'thin texture, and managed it rather well considering I was a) drinking wine and b) it got dark. 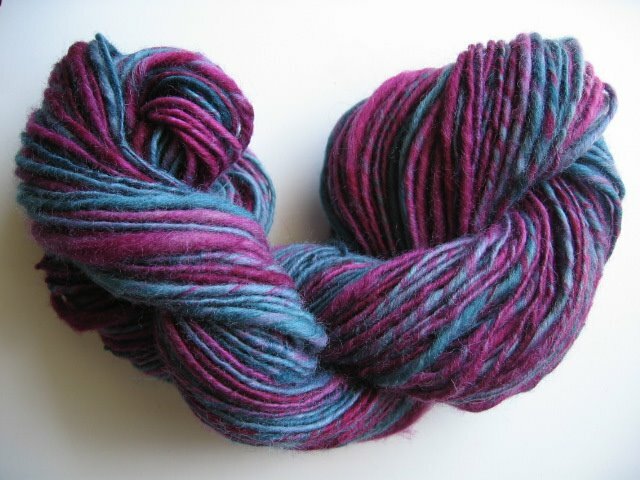 There's 100g, hand-dyed (not by me) English wool in shades of jade, turquoise and wine. The fatter slubs aren't evenly spaced yet that's not an issue - I managed to control the wheel enough to get the texture I wanted. Feel like a proper spinner now! This next one is even lengths of blue and green merino, and then plied with a purchased silk which combines both colours. It's not as constant in gauge as I'd like, but I'm definitely getting better. Not sure of weight or yardage, will need to measure those. It will self stripe too, so should make a nice Hat. Am quite pleased with my plying also. Late addition:- My Dad has emailed over this photo from wednesday night, of me showing off spinning in the dark (prior to head injury, obviously) Maybe I should call the resultant skein 'drunk and disorderly' or 'dutch courage'? Suggestions welcome ;) That's my mate Sara to the left - we've known each other since school and she is wonderfully tolerant of my sometimes strange behaviour. Now I really must have more coffee and wake up. There's a serious amount of housework to do and as much as I'd rather play with fibrey things, the mess in this flat is doing my head in.